Exclusive to the GMC Denali is GM’s Adaptive Ride Control (ARC) shock absorbers. These shocks are electronically controlled and adjust to various road conditions within milliseconds giving an exceptional ride quality both on and offroad. Fabtech retains these quality ARC shocks in their 6” System for the Denali with heavy duty relocation brackets. 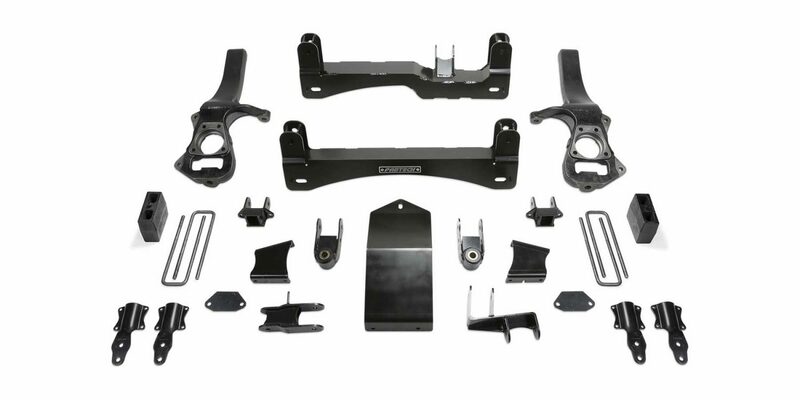 In designing this system, Fabtech engineers focused on building a system that has zero bump steer throughout the suspension cycle. This is key in reducing driver fatigue while improving the overall drive ability of the vehicle. The near stock track width was accomplished to keep oversized tires under the fenders for a clean appearance. Fabtech‘s proprietary steering knuckle geometry provides excellent lock to lock turning radius to help you maneuver in tight spots. Heavy duty 1/4″ thick steel crossmembers feature OE style alignment cam pins that utilize the factory cams for quick easy adjustment. Triple front diff mounts reposition the differential for vibration free operation at high speed. Rear lift is accomplished by removing the factory 2” block and replacing it with a 5” Block and u-bolt system. Fabtech has addressed all aspects of this Denali suspension for proper ARC shock compatibility with the new 6” lift height. This quality system comes with a free 5 year 60,000 mile Powertrain Warranty.